Chemistry and Materials Science, Geochemistry, Industrial Waste Treatment, Mass Spectrometry and Chromatography, Metallic Corrosion and its Control, Metallurgy, Natural Products, Organic Geochemistry, Petroleum Geochemistry, Phytochemical Screening of Plant by GC-MS, IR and NMR, Solvent Extraction, Synthesis and Analysis of Nitro-Compounds, Synthesis of Inorganic Catalysis, Ultra-Fast Chemical Reaction and LASER Spectroscopy, Algebra, Applied Approximation Theory, Applied Statistics, Bayesian Inference, Design of Experiment, Differential equations and Mathematical Physics, Discrete Event Dynamic System, Discrete Mathematics, Fixed Point Theory, Fuzzy Topology, Generalized Linear Models, Geometric Modelling, Geometric, Graph theory, Maximal Functions, Monte Carlo Integration, Neural Network, Operation Research, Oscillatory Integrals, Partial Differential Equations (PDEs), Point Set Topology, Population and Demographic Studies, Regression and Correlation, Sampling Technique, Sampling Theorem, Signal Analysis, Simulated Annealing, Singular Integrals, Statistical Inference, Stochastic Optimization, Surveys and Sampling Techniques, Survival Analysis, Time Series, Life Sciences, Physics and Mathematics, Astrophysics and Cosmology, Atmospheric Physics, Atomic Physics, Biophysics, General and Special Relativity, Material Sciences, Mathematical Physics, Mechanics, Neural Processing, Nuclear and Particle Physics, Optics and Lasers, Physics in Medicine, Plasma Physics, Plasma Physics, Pure Mathematics, Quantum Mechanics, Radiation Physics, Pharmaceutical Sciences, Sea Science, Bioengineering, Computer Science and Communications, Telecommunication, Transportation Science, Biostratigraphy, Carbonate Sedimentology, Chemostratigraphy (Sequence Geochemistry), Economic Geology, Geoenvironmental Assessment and Monitoring, Assets and Capital Systems, Macroeconomics Economic Modeling, Marketing, Microeconomic Theory, Normative Economics, Political Economy, Public Sector Economics, Quantitative Economics, Social Networks, Tax Policy, Trade and Development, Trends in Market and Socio-Economic Contexts, Unemployment, Wage Determination, Legislative and Executive Behaviour, Legislative Politics in Parliamentary Democracies, New Public Management and Globalization, Party Competition and Party Policies, Political and Philosophy, Economy of Democracy and Development, Political Institutions, Political Reforms, etc. 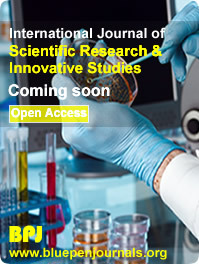 All articles that are submitted to this journal are made to undergo sectioning to ensure that they are in line with the scope of IJSRIS and as well as the instructions for authors. Thereafter they are double-blindedly peer-reviewed by both internal and external reviewers. More than 100 reviewers are working diligently to shorten the review cycle of the academic research publication; and help researchers to pay more attention on the research itself, not waiting for too long, for suggestions from reviewers. The electronic version of published article is available at www.bluepenjournals.org/ijsris. The articles on this website are available in abstracts and full-text; and are accessible, free of charge to our web visitors. Copyright is a major issue for IJSRIS. Manuscript submission and their accessibility is not an infringement of copyright. All articles in IJSRIS remain the property of their authors. The contents of published articles represent solely the ideas of authors. Editors as well as Board of Editors of IJSRIS are not responsible for the views expressed by authors. However, the Editorial Board of IJSRIS takes responsibility for making publication decisions for submitted manuscripts based on the reviewer�s evaluation of the manuscript, policies of the journal Editorial Board and legal restrain acting against plagiarism, libel and copyright infringement.